Bengaluru Bulls could muster only three tackle points in the match. 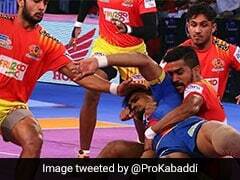 In a close contest, Bengal Warriors held their nerves to edge out Bengaluru Bulls 33-31 in a Pro Kabaddi League (PKL) match on Friday. Bengal's Maninder Singh had an excellent game and scored 14 points, while Mahesh Goud was a fine supporting act for Maninder as he chipped in with 6 crucial raid points. Pawan Sehrawat got yet another super 10 for Bengaluru Bulls but his effort went in vain. Bengaluru Bulls' defence was the biggest reason for their downfall as they could muster just three tackle points in the match. Rohit Kumar and Maninder Singh got a couple of raid points each for their teams as both teams were neck to neck after three minutes of play. Mahesh Goud's raid in the fourth minute gave Bengal a chance to level it at 4-4. In the 7th minute, Kashiling Adake made a successful raid to level the score at 6-6. There was little to separate the two teams as both refused to give an inch. Rohit made a two-point raid in the 13th minute to give Bengaluru Bulls little breathing space as they led 11-9. Bengal fought back as they inflicted an all out in the 15th minute to lead 13-11. It was a closely fought encounter but Bengal went into the break holding a four point lead with the score reading 18-14 in their favour. Maninder Singh continued his fine raiding form with a point at the start of the second half. He followed it up with a two-point raid in the 23rd minute as Bengal led 23-15. Bengaluru fought back in the next few minutes as they cut the deficit to five points in the 29th minute. Pawan came with a moment of brilliance as his two-point raid led to an all out and Bengaluru Bulls tied the match at 26-26 in the 33rd minute. In the next minute, Maninder responded with a super raid to give Bengal 29-26 lead. The last five minutes were a tense affair but Bengal refused to panic. Kashiling got two raid points in the last couple of minutes of the match to keep Bengaluru within touching distance. It was Maninder yet again, who scored a raid point in the 38th minute to give Bengal Warriors 33-28 lead as they were assured of full points in the match. Bengaluru picked three points in the dying moments but fell short narrowly to lose the contest.